Choose from one of the packages below to navigate to a package specific to each engine family. 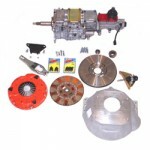 Our packages are currently available for the Tremec T-5 behind Small Block Chevrolet, Small Block Ford and Rover V8. We also have packages for Tremec TKO 500 behind Chevrolet, Small Block Ford and Rover V8 and the Tremec TKO 600 for Small Block Ford, Rover V8 and Chevrolet V8 including Chevrolet LS engines . We also stock packages for the Tremec T56 Magnum transmissions. We have produced a range of Tremec gearbox packages utilising the Tremec T-5, TKO-500 and TKO-600 that enable simple installation behind either one of our engine packages or as replacement for an automatic or other manual transmission. 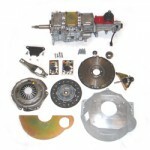 We also supply the Tremec T-5, TKO500 TKO600 and T-56 Magnum together with related components for many other engines although these are not usually held in stock as ready to fit packages. 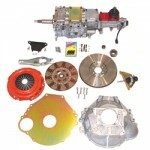 The packages include all parts required from the back of the block and are set up for hydraulic clutch operation. Cable clutch can also be used with these packages but is not included as the cables are specific to the vehicle. The Tremec gearbox packages would not included prop shaft (or yoke), speedo cable (and gear that attaches to cable), top section of gear lever and gear knob (vehicle specific) or transmission fluid. These parts would either be available separately from ourselves, or in the case of the prop shaft, would be supplied by the vehicle manufacturer or made by an independant prop shaft firm.